HOUSTON (AP) — Crews on Wednesday extinguished a fire that had burned for days at a Houston-area petrochemicals storage facility and led to concerns about air quality among some residents and environmental groups despite reassurances from officials that testing shows nothing amiss. Intercontinental Terminals Company spokeswoman Alice Richardson said at a news conference Wednesday that crews were cleaning up the facility in Deer Park, located southeast of Houston, so the investigation can begin into what caused the blaze. The fire, which started Sunday , sent a huge, dark plume of smoke thousands of feet into the air before being extinguished at 3 a.m. Wednesday. The tanks that caught fire contained components of gasoline and materials used in nail polish remover, glues and paint thinner. ITC said 11 of the 15 storage tanks located in the area where the fire occurred were damaged. The blaze briefly flared up late Wednesday afternoon. The flare-up, which sent flames and smoke into the air, was contained within 30 seconds by firefighters, the city of Deer Park said in a tweet. The Environmental Protection conducted air quality tests throughout the Houston area, both on the ground and from a small airplane, and “measured no levels of hazardous concentrations,” said agency official Adam Adams. The EPA also reviewed data collected by ITC, Harris County, where Houston is located, and by the Texas Commission on Environmental Quality and that data did not show hazardous concentrations of volatile organic compounds, Adams said. The state environmental agency said in a statement Wednesday that the benzene levels it found near and around the storage facility do not pose a health concern. But some residents who live near the storage facility said Wednesday they don’t have confidence in the air quality test results. “Everything has been wrapped up in this nice perfect bow in saying that there were no problems. Every air quality was perfect. Every wind was perfect blowing it away. And if everything was so perfect, why did it happen?” longtime Deer Park resident Terri Garcia said. Bryan Parras, an organizer in Houston with the Sierra Club, said some residents who live near the facility have experienced various symptoms since the fire, including headaches, nausea and nose bleeds. He said his environmental group has concerns not just about the air quality, but about potential impacts to the environment and the fishing industry if chemicals from the storage facility or foam used to fight the fire leaked into the Houston Ship Channel, which leads to the Gulf of Mexico. “This issue isn’t over just because the fire is out. We want systems in place that will protect our communities,” Parras said. 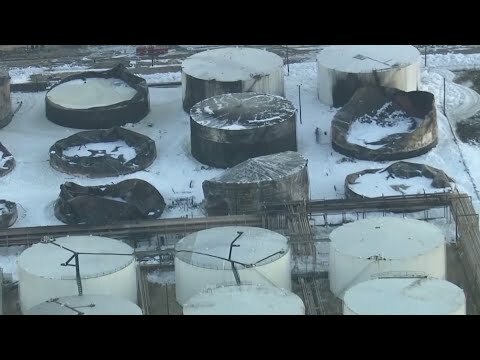 The EPA and the TCEQ said they are waiting for test results of water samples to determine any potential impacts from the foam used to fight the fire on waterways next to the storage facility, including the Houston Ship Channel. Sema Hernandez, who lives in Pasadena, just west of Deer Park, said all four of her children have experienced headaches since the fire started Sunday. But she has not been able to take them to a doctor because she doesn’t have health insurance. “This shouldn’t have happened. ... But it did. My question is, what do we do now?” Hernandez said. At a news conference Wednesday afternoon, Harris County Judge Lina Hidalgo, who took office in January, said she understands the fears and concerns some residents have had but she and other officials have worked to be transparent with the public. “From the beginning of taking office, I said we need to move toward a place of transparency and we need to move toward a place where we recognize our environment and our health as a human right,” said Hidalgo, the county’s top administrator. Richardson said her company has been in Deer Park for more than 40 years and would work to regain the community’s trust. Garcia said she fears that she and other residents will be dealing with the impacts of the fire long after people have forgotten about it. “We are going to be the ones figuring out what was really in the air ... because our families are the ones going to be sick,” she said. This story has been corrected to show that the name of the company that owns the petrochemicals storage facility is Intercontinental Terminals Company. Associated Press writer David Warren in Dallas contributed to this report.